The United States Congress designated the Pecos Wilderness (map) in 1964 and it now has a total of 221,806 acres. All of this wilderness is located in New Mexico and is managed by the Forest Service. Deep and narrow canyons, long and broad mesa tops, heavily forested slopes, and rugged ridges with peaks above timberline characterize the Sangre de Cristo Mountains of the Pecos Wilderness. This small mountain chain comprises the extreme southern extent of the Rocky Mountains, North America's longest mountain chain, which extends north all the way into Canada. On the western side steep canyons drain toward the Rio Grande. In contrast, to the east lies the relatively gentle upper Pecos River Valley, an area of broad flat mesas and grassy meadows. There are restrictions pertaining to camping on most of the lakeshores in order to protect wilderness values. At least 15 of the lakes offer first-rate fishing, as do 150-plus miles of sparkling streams, where rainbow trout, brown trout, and the NM state fish, the Rio Grande cutthroat trout can all be found. These waters head the Wild and Scenic Pecos River, for which the wilderness is named. The high country elevations range from 8,400 feet to 13,103 feet atop South Truchas Peak, the state's second highest point. The scenery varies from 100-foot-drop waterfalls and crumbled talus slopes to dramatic rock cliffs, towering peaks, and wildflower meadows best caught in July and August. Engelmann spruce, corkbark fir, ponderosa pine, Douglas fir, white fir, limber pine, bristlecone pine, and aspen are the predominant timber species. Equally diverse is the wildlife, including elk, deer, bear, turkey, and one of America's healthiest herds of Rocky Mountain Bighorn Sheep. The northern section includes about 25,000 acres in Carson National Forest, the least visited portion of the Wilderness. The rest of this large area lies in Santa Fe National Forest, with easy access from Santa Fe, Albuquerque and surrounding towns. Most hikers come during the summer months to explore the extensive system of trails. 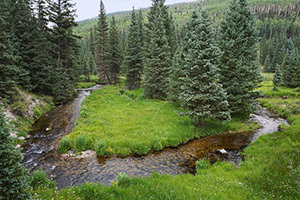 Planning to Visit the Pecos Wilderness? How to follow the seven standard Leave No Trace principles differs in different parts of the country (desert vs. Rocky Mountains). Click on any of the principles listed below to learn more about how they apply in the Pecos Wilderness.